A revenge drama with evident shades of Kill Bill set at the backdrop of Chennai manages to keep you on the edge of the seat at times. CV Kumar the director of science fiction Tamil film Maayavan has once again come up with quite a good flick. Some films just comes in to the theatre as an underdog and takes you by surprise by delivering a surprise package. 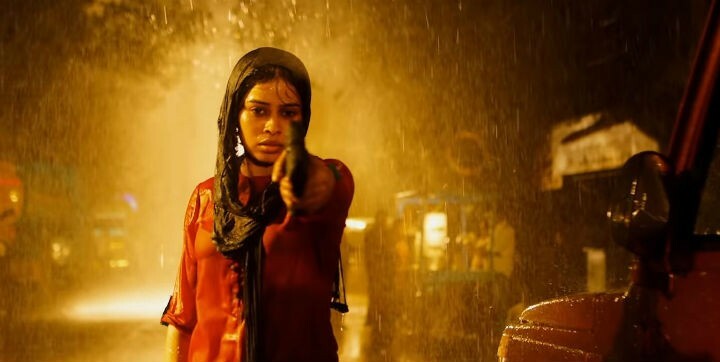 Gangs of Madras is one such film if you go in to the theaters with a blank mindset. The film is developed around the popular African proverb ‘The axe forgets but the tree remembers.’ Jaya (Priyanka Ruth) an independent woman who falls in love with Ibrahim (Ashok Kumar) decides to throw everything in life that she holds dear including her name to lead a life with him. So Jaya becomes Razia Sultana to lead a life with Ibrahim. The couple filled with lot of promises begin their journey on a positive note. But things go reversal when Ibrahim’s urge to get rich soon gets him killed in a shootout. Like how Uma Thurman in Kill Bill manages to survive the shootout here Razia manages to survive. And alike how Uma Thurman is frenzied by vengeance after the loss of her love and her child in her womb, Razia Sultana suffers the same anguish. In a scene which depicts the childhood of Razia we get to see her giving it back to a kid who hurt her three months back. The scene and the dialogue that follows clearly puts her in the frame of a revenge seeking personality, but little do we know that she would turn in to a cold blooded avenger to get her revenge done. She comes to know that Rowther (Velu Prabhakaran) and his sons are responsible for the orchestrated encounter that killed her husband. She learns that Rowthar is a powerful underworld gangster who takes care of the cocaine distribution business of Lala. She learns that it is difficult to take down him and she flees to Mumbai seeking the help of Rowther’s rival Boxy (Daniel Balaji). After getting trained in everything it takes to become a warrior she returns to Chennai to unleash her revenge. Priyanka Ruth seems to be a fantastic addition to the Tamil industry. Literally, she is the one that lures you in to the movie and keeps you invested in the film. She has made the journey of Razia in to the gangland that belongs to cold blooded gangsters, middlemen and politician too convincing. Velu Prabhakaran, the top most controversial filmmaker serves the purpose aptly for why he was roped in to play Rowther. The back ground score for the film needs a special mention here as Shyamalangam covers the lack of depth in characterization with his vibrant and pulsating back ground scores. CV Kumar leaves too many holes in the script which otherwise had the potential to get in to the list of classic gangster movies of Tamil cinema.